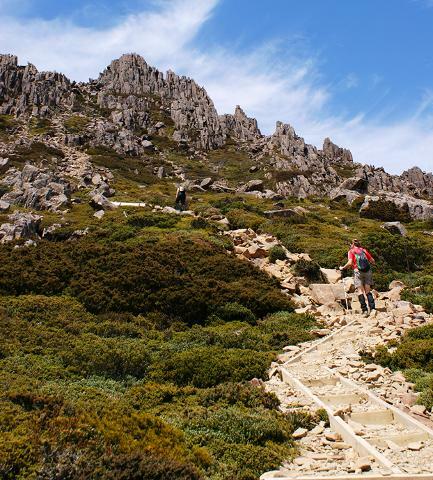 The Overland Track holds a legendary status as one of the finest walks in Australia. 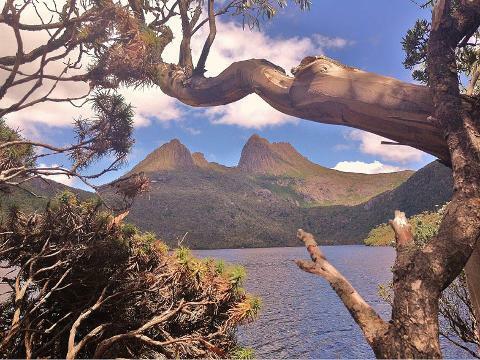 Winding you way along a graded trail through the Tasmanian Wilderness World Heritage Area with each step you will be surrounded by breathtaking views, from the stunning crags of Cradle Mountain to the rainforest-clad shores of Lake St. Clair. Your journey will lead to new discoveries and some of mother nature's finest creations including waterfalls, dolerite mountains, lakes, tarns and diverse ecosystems. The itinerary is ideal for walkers looking to make the most out of their time in the area by appreciating the many highlights and exciting side trips you'll undertake along the way. 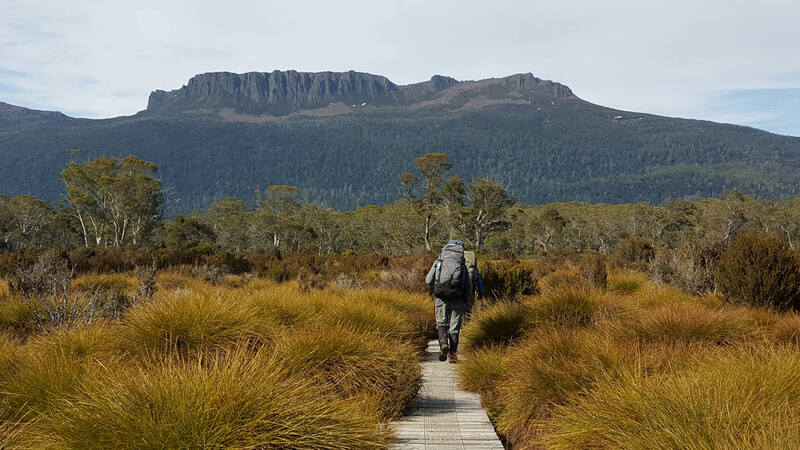 This full pack trek is suitable for first time bushwalkers as the inclusion of food drops and modern lightweight equipment will keep your backpacks as light as possible while your experienced guides will help bring the track to life thanks to their local knowledge and enthusiasm for the Tasmanian wilderness. A compulsory pre-trip briefing is held at 2pm the day before this trip commences. More details will be provided upon booking. We will pick you up from Launceston hotels between 7.00 - 7.30am. 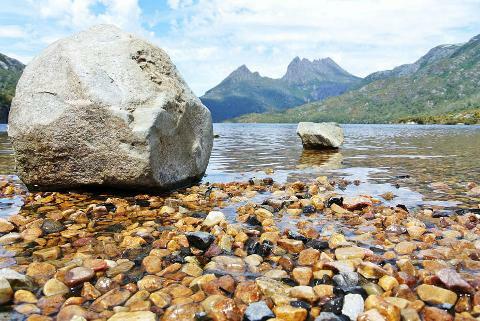 We drive 2.5 hours to Dove Lake where our Overland Track Trek begins. We spend the morning walking up to the top of the Cradle Plateau where we are rewarded with views of Dove Lake below. 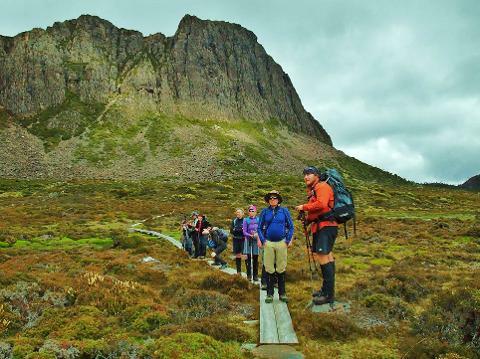 After enjoying lunch we may opt for a side trip, weather and time permitting, to the craggy summit of Cradle Mountain before making our way to Waterfall Valley for our first night under the stars. Today we continue south from Waterfall Valley to Lake Windermere. A leisurely day that offers time for a side trip past the diggings of Joseph Will a coal prospector in the 1800’s to Innes Falls. At Lake Will we will have the opportunity for a relaxing lunch on its sandy shores. Returning to our packs we head back across the rolling button grass plains towards our campsite at Lake Windermere. We spend the afternoon relaxing, taking in the fabulous views and maybe go for a refreshing swim in the lake. Today is a wild day of moorlands and mountain views. Our morning takes us across Pine Forest Moor offering spectacular views across the Forth River Valley to the heights of Mount Oakleigh and to today’s destination, Pelion Plains, at its base. We descend around Mount Pelion West to a popular lunch spot at Frog Flats. Our afternoon takes us up onto Pelion Plains with marvellous views of fluted Mount Oakleigh and some of the biggest wombats our guides have seen in the park!!! Our main food drop is hidden not far from here and your guides will make time to collect supplies. From camp we continue walking south and the view opens up to reveal Cathedral Mountain and Pelion East on our left, followed by Mount Ossa on our right. We rest at the saddle (1113 meters) between Mount Pelion East and Mount Ossa. 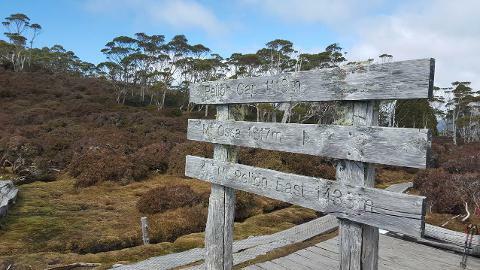 In fine weather, climbing Mount Ossa (1617m), Tasmania’s highest peak is without a doubt one of the highlights of the Overland Track. With magnificent views in all directions we continue south into beautiful Pinestone Valley. is the spectacular Hartnett Falls, named after the eccentric bushman with the bowler hat Paddy Hartnett. We make camp in the afternoon at Windy Ridge. Today we pack our backpacks for the final day on the track, which takes us through dry sclerophyll forest toward the shores of Lake St Clair. As we near the lake we can gaze up to the peaks of the Labyrinth and look forward to majestic Mount Olympus. We then catch a 30 minute ferry across Lake St Clair, the deepest natural lake in the southern hemisphere, providing a spectacular conclusion to our Overland Track Trek as we look back upon the mountains we’ve travelled through. After some time to inspect the visitor center and a brief lunch interlude we board the bus for our return drive across the Central Plateau to Launceston. You will be dropped off at your accommodation in Launceston at approx 5pm. Depending on the quantity of personal gear and toiletries the average pack weight will be between 14-18kg. A comprehensive gear list is available from the reservations office that details what clothing and equipment is required for each expedition. It is specific to each type of trip and clearly sets out what equipment is included in the tour cost and what you will need to supply.